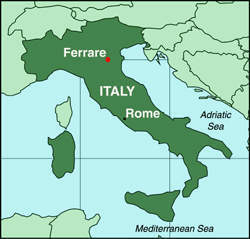 Location of Solvay's PVC Recycling Plant at Ferrara. 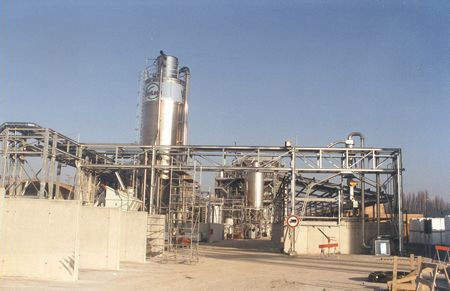 The PVC Recycling Plant at Ferrara. PVC Recycling Plant at Ferrara. The Ferrara PVC recycling plant project is a pioneering recycling operation based in Ferrara in northern Italy. The plant is designed to recycle PVC from cable insulation and other scrap materials. It is the first of ten PVC recycling plants that Solvay is considering building across Europe with its patented Vinyloop technology. The plant has been achieving steady growth in the recycled PVC produced since the time of its start up. The €10.6m ($14.5m) Ferrara project got the final go ahead in June 2000, and achieved mechanical completion in November 2001. Due to a number of minor mechanical problems, it took some months to improve and test the plant, however it was inaugurated at the end of February 2002. The plant was originally designed for a capacity of 8,500t/yr in terms of raw PVC produced for recycling. This was achieved at a cost of €10m ($7.98m). The plant, however, recycled 11,500t of post consumer waste to produce 9,000t of reconstituted PVC (R-PVC) in 2008. Although small in scale, the new plant is interesting in terms of the process technology it uses. 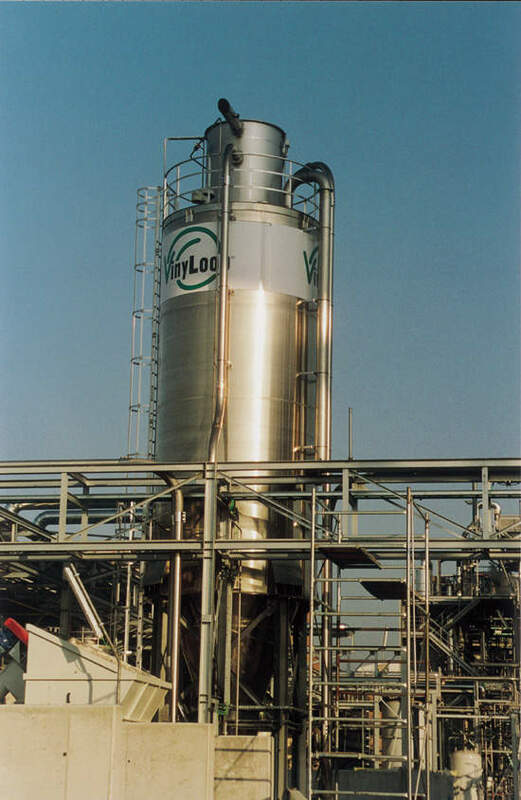 The Ferrara recycling plant uses a new technology called Vinyloop. 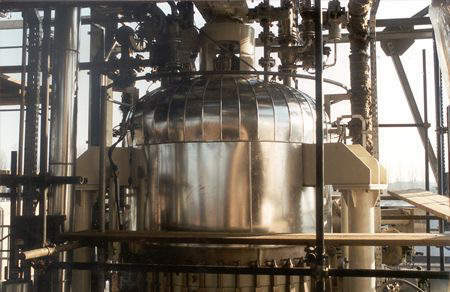 The technology was developed by Solvay’s R&D centre in Brussels and awarded patent rights in 1998. The process uses the total solubility of PVC in solvents to separate the PVC from other components in the scrap. The initial “feedstock” of the plant is mainly cable scrap and packaging. Other sources of PVC include pharmaceutical blister packs, floor coating and car dashboards. This spent PVC has hitherto been hard to recycle in a commercially viable way. The PVC is cut into small parts in order to maximise surface area, it is then completely dissolved in a solvent. After dissolution, the PVC is recovered from solution at a quality which the developers believe to be equal to that of virgin material. This is done by precipitation. Moreover, the PVC produced by the recycling process features granulometric properties that improve the efficiency of the processing steps when it is re-used. The smoothness and homogenity of the granules improves their fluidity, and thus make them more desirable. Once the PVC is recovered from the solvent, the solvent is also recovered for re-use. Therefore, the process is a closed loop in which (theoretically) 100% of the material is recovered. However, this does not quite happen in practice as no cycle is entirely perfect. This Vinyloop process is not confined to just PVC from cable scrap. It is also to be used in a tarpaulin recycling project by Ferrari Textiles Techniques in France, where it was first developed. However, the Ferrara site is the first application of the technology on an industrial scale. Solvay, which supplied Ferrari Textile Technique’s PVC, developed the recycling technology. As a result, the Belgium-based firm owns the license for the new process technology. The technology is claimed to be commercially viable as well as environmentally beneficial, giving Solvay a significant commercial advantage. The plant is run by a consortium of four companies. These are: Solvin Italia (which is part of Solvin, the 75% Solvay and 25% BASF European PVC producer), Adriaplast (an industrial sheet, food packaging and credit card producer in the Solvay group), Technometal (the electricity and telephone cable producer), and Vulcaflex (which coats and calenders PVC for various applications). The impetus behind all these companies co-operating in the new venture is environmentalism. As a non bio-degradable material, polyvinylchloride (PVC) is unpopular with the green lobby. To fend off public pressure which might lead to compulsory regulation, various PVC producers have opted for a voluntary code. The Ferrara plant is evidence of their determination to improve the rate of PVC recycling. As a result, the development is in conformity with the requirements of the objectives set by the Charter of European Council of Vinyl Manufacturers (ECVM), as well as the recent decisions of the International Commission for the protection of oceans and sea life (OSPARCOM Commission) with regards to PVC production. 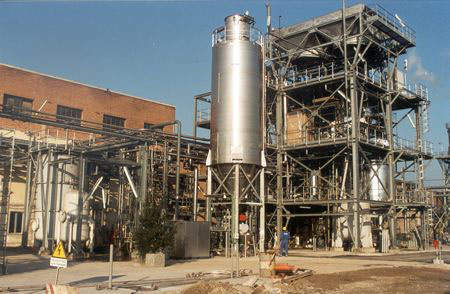 Solvay achieved installation of second generation technology process equipment of Vinyloop in 2006. It is expected to reduce investment by more than 20% and energy consumption by 25%. This technology is expected to be used in a number of new projects across Europe. They will include a flooring project in Germany, and cable projects in Germany, the UK and Spain. These projects were scheduled to begin in 2004, but were delayed as the process was still considered expensive. Solvay collaborated with Kobe Steel for an 18,000t/y second Vinyloop plant in Chiba, Japan. There are projects planned in the Netherlands and Canada as well.